The potential and limitations associated with inclusionary zoning are explored in a new Urban Land Institute report. The potential and limitations associated with inclusionary zoning, a tool used by a growing number U.S. cities to encourage or require workforce housing development, are explored in a new Urban Land Institute (ULI) report, The Economics of Inclusionary Zoning. While many U.S. cities have experienced a post-recession economic revival, the accompanying run-up in housing costs are threatening to undermine this success by pricing workers out of cities, lengthening commutes and diminishing livability, notes the report. As a result, local officials are turning to inclusionary zoning as a way to combat the shortage of housing that is affordable to moderate and lower-income workers. Through inclusionary zoning, cities require or encourage developers to create below-market rental apartments or owner-occupied housing in connection with local zoning approval of a proposed market-rate development. Inclusionary zoning policies depend on a prevalence of market-rate development to be successful; the policies tend to be ineffective in areas not experiencing significant market-rate activity. “Our analysis and research finds that local zoning policies can effectively encourage development of workforce housing, mostly in strong real estate market environments where communities provide the optimal mix of incentives,” said report author and Terwilliger Center Executive Director Stockton Williams. More than 500 cities and counties in 27 states and the District of Columbia have adopted inclusionary zoning policies that are either mandatory, voluntary, or which incorporate a mix of the two approaches, the report notes. In general, the less flexible policies tend to be mandatory, require greater set-asides of affordable units, impose longer rent restrictions, target a lower-income category, and they are applicable community-wide with no opt-outs and few or no incentives to make the policies more appealing to landowners and developers. The more flexible policies tend to be voluntary, require fewer set-asides, impose shorter rent restrictions, have a higher-income target, apply to specific housing types and locations within a community, make opt-outs available, and include market-responsive incentives. Optimizing the effectiveness of incentives for inclusionary development, including direct subsidies, tax abatements, density bonuses and reduced parking requirements. 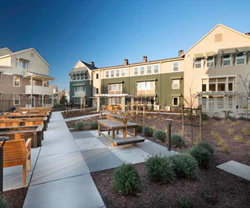 REPORTERS AND EDITORS: To interview Stockton Williams on The Economics of Inclusionary Zoning or other housing-related topics, or to speak with other ULI experts on land use and real estate issues, contact Trish Riggs at 202-624-7086 – office; 202-679-4557 – mobile; or priggs(at)uli(dot)org. The Urban Land Institute is a nonprofit education and research institute supported by its members. Its mission is to provide leadership in the responsible use of land and in creating and sustaining thriving communities worldwide. Established in 1936, the institute has nearly 40,000 members worldwide representing all aspects of land use and development disciplines. For more information, please visit uli.org or follow us on Twitter, Facebook, LinkedIn, and Instagram.